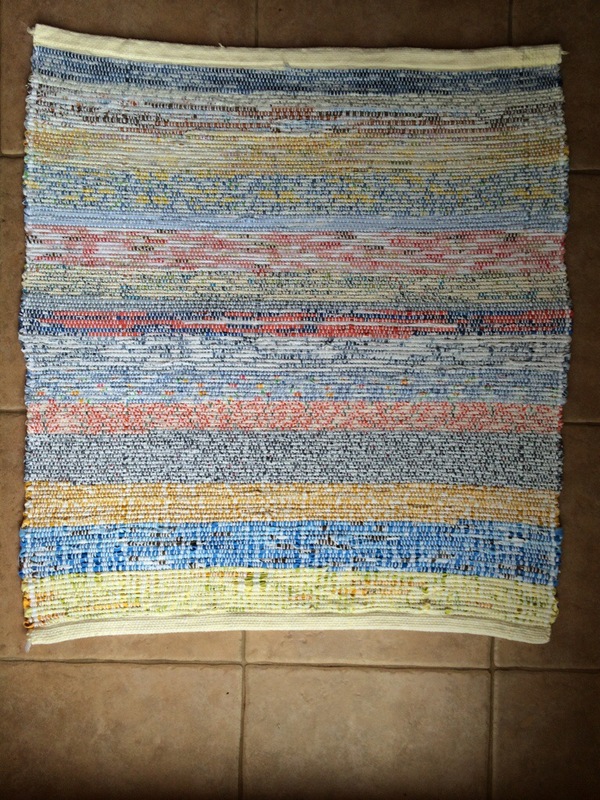 I was so eager to finish this rug, to see how it turns out that I neglected other wips, woke up early and it was off the loom and hemmed before I needed to leave the house. I even skipped lunch. Here it is before wet finish. First thought: the colors make me so happy and this thing is so soft. Second thought: this thing is so soft! Is a rug supposed to be this soft? The closeup above shows the spaces between the strips. Unfortunately I did not take a picture of the beginning of the rug where this problem is most visible. Notice that the warp is nicely evenly spaced. The “back” of the rug. 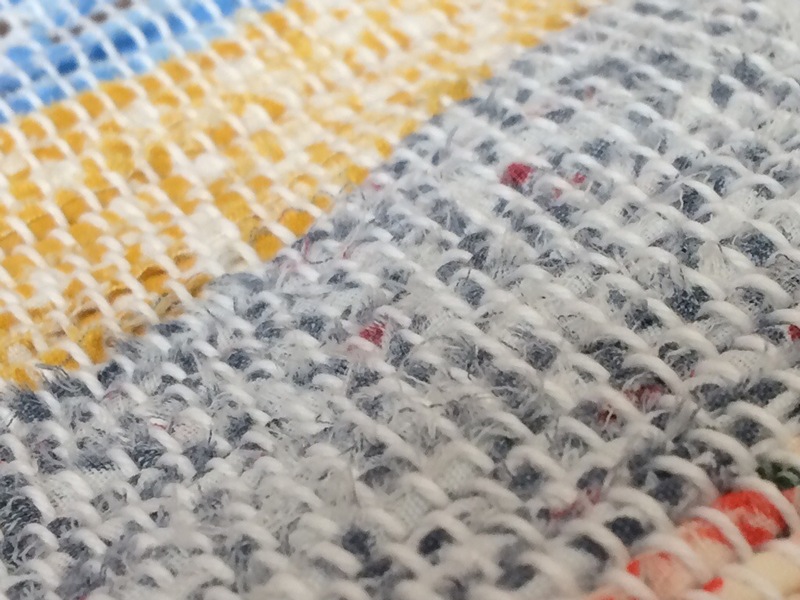 As I was weaving I laid each folded strip flat before beating, the raw edge facing up, towards the loom. By folding I wanted to prevent the back side of the fabric showing. 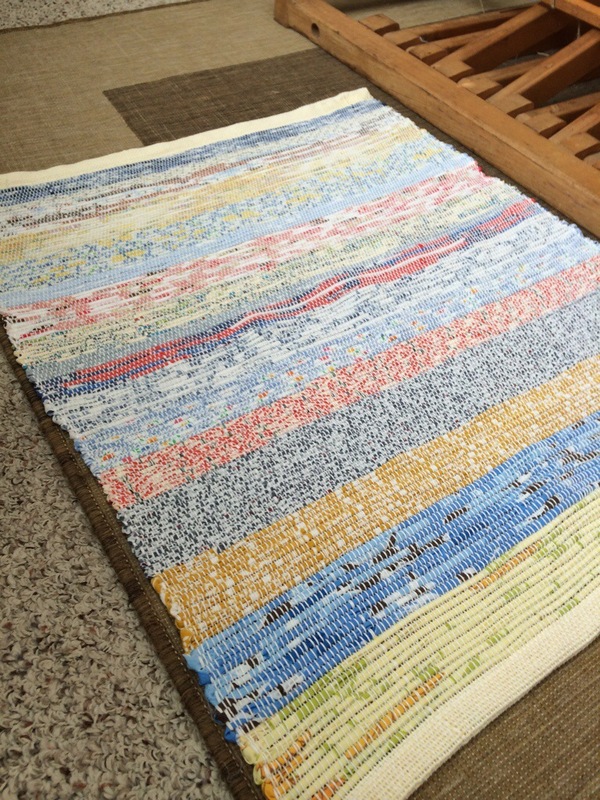 It turns out most of the raw edges folded down, which is now the back of the rug. 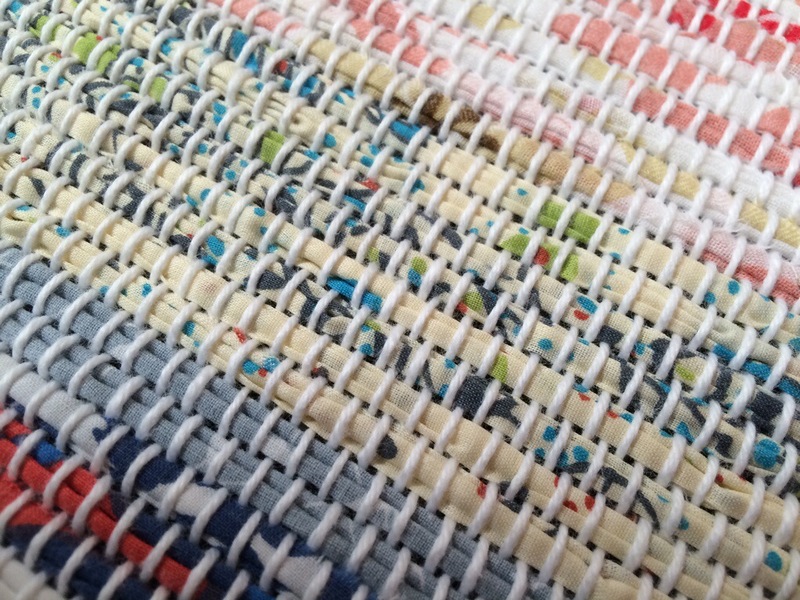 on the loom: width 26in, length 40 in. after washing: width 24in, length about 33 in. This is the bottom part, the one that was the loosest. 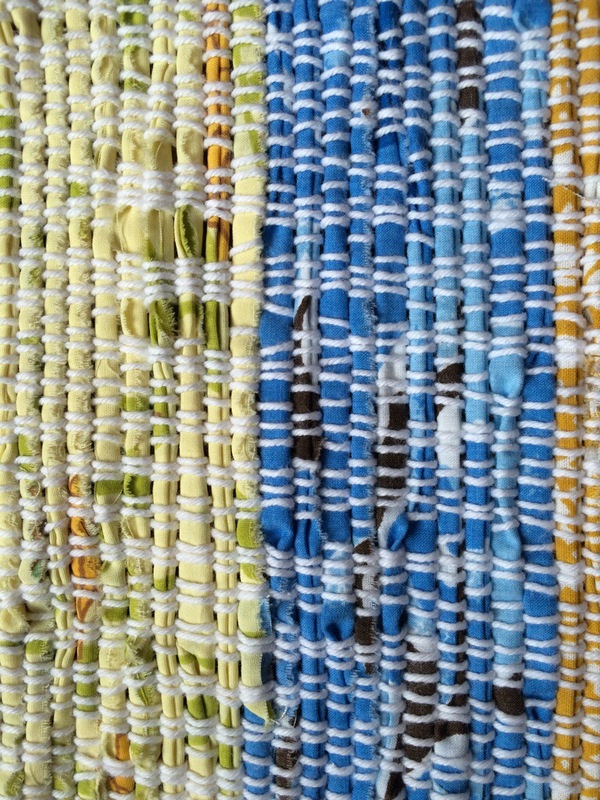 You can see how loose it still is and how much warp has shifted, moved because the weaving was not tight enough. So a little disappointed, but I really want to start another one. The left over yarn is still on the loom so I could just tie the new warp on, so I don;t have to sleigh (is that the right spelling?) the reed to thread the heddles agin. And I think that’s what I will do. But I need to change some things. What? I am not sure right now. 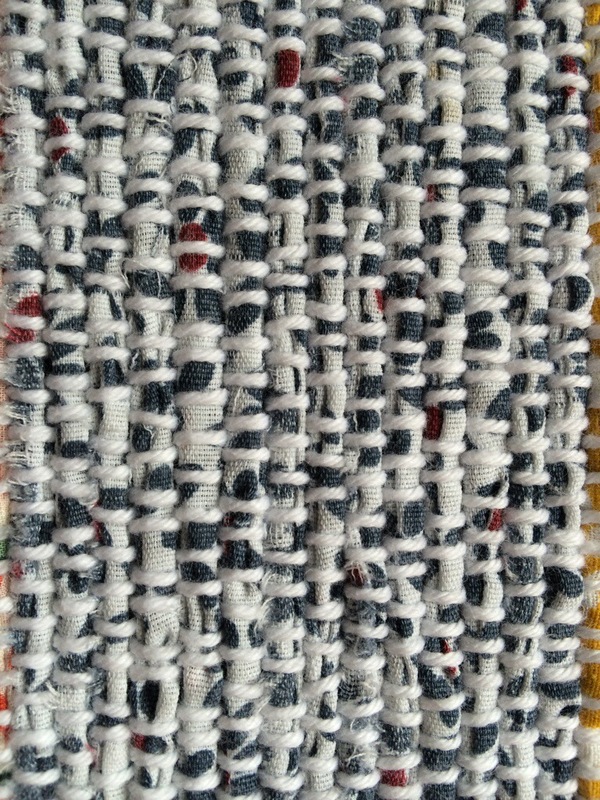 I am a little worried that my loom might not be strong enough for rag rug weaving (some googling suggested that). Apparently jack looms are sometimes not heavy enough and cannot hold the high warp tension these rugs need (shed might not be opening enough). That would be quite disappointing. Because they are so much fun! But some people were able to use their looms. I’m hoping. So… this is not going to end up as a rug. 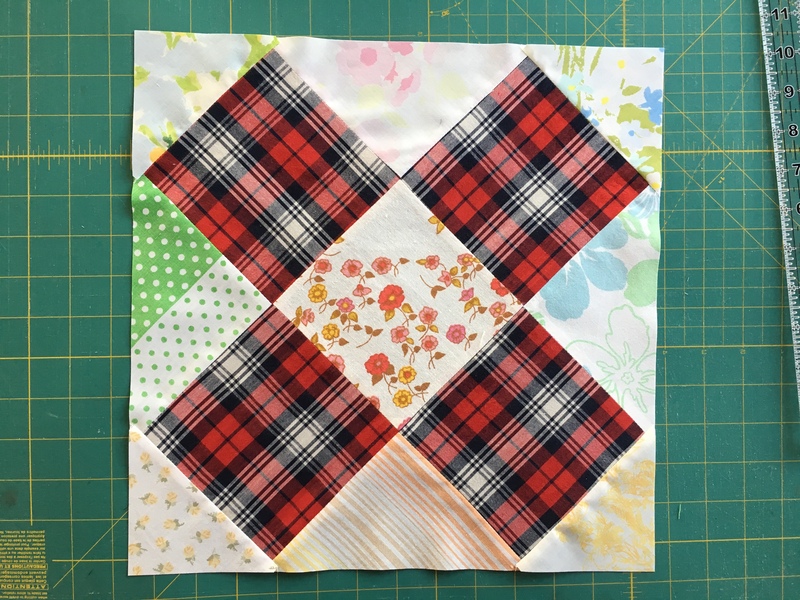 Making a pillow cover? Or cut it up into coasters? Something useful, because – did I mention haw happy these color make me? 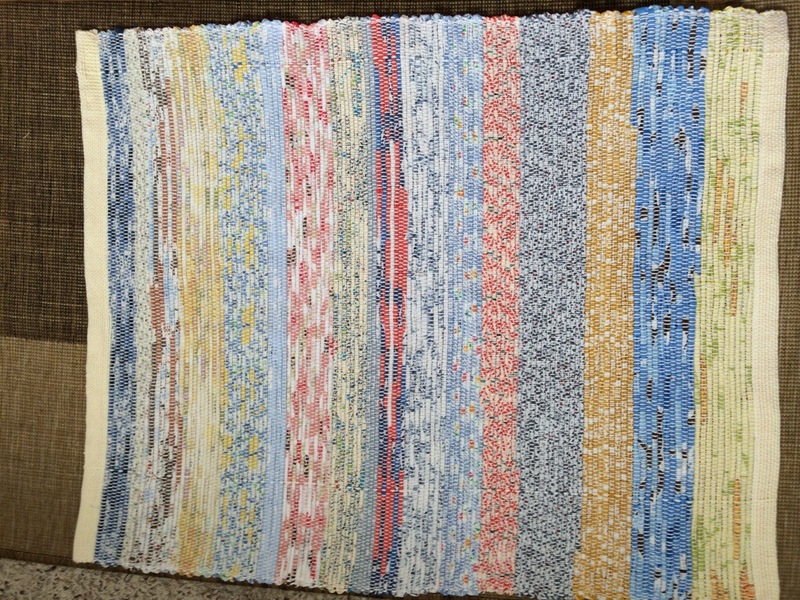 This entry was posted in weaving and tagged rag rug, thrifted sheets on August 22, 2014 by flekka.